One aspect of the localrootz homestead that I haven't touched upon yet has to do with projects that enhance its aesthetic appeal. 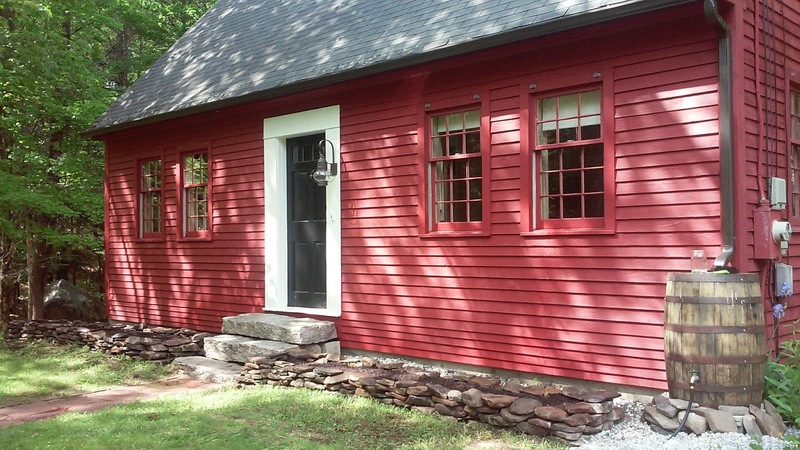 Our home is a reproduction home built in the mid 1980's with some modern touches like electricity, insulation, skylights and a poured concrete basement. The overall feel of the place harkens back to colonial times and mimics the colonial cape cod style that goes back to the 17th century. In keeping with the spirit of the home we strive to improve upon the foundation the original owners/builders created using natural materials whenever possible and keeping the home and it surroundings symmetrical and simple. With that being said when we moved into the home it was clear that the front of the house needed a bit of subtle charm to ground the house to its landscape. It appeared there once was some bushes that probably got a little too friendly with the lower clapboards creating a problem that was remedied by removing the bushes and replacing the clapboards. 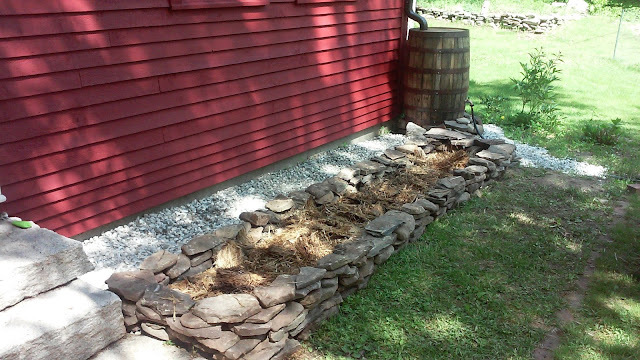 The first part of the project was to trim back all the weeds and stray roots and lay a nice layer of blue stone drainage rock along the foundation. Because the warm weather has arrived and the weeds and root situation needed some attention I chose to lay a double layer of weedblock landscape fabric down to smother any persnickety lingering weeds and just create a pair of small rock wall flower beds to spruce up the front of the house. 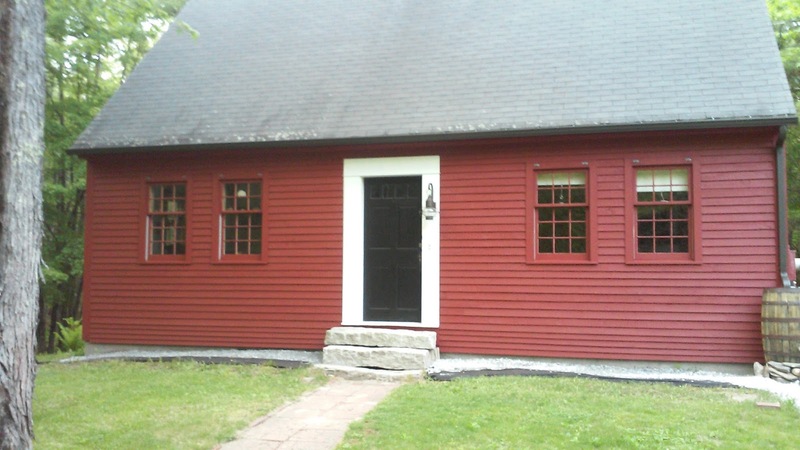 Before I start putting obstacles down in front of the house I figured Id take the opportunity to get a coat of red barn stain slathered on the clapboards. I picked out a pallet of fieldstone from a local spot and got to work laying out a 6-8" tall wall running about 12ft on each side. 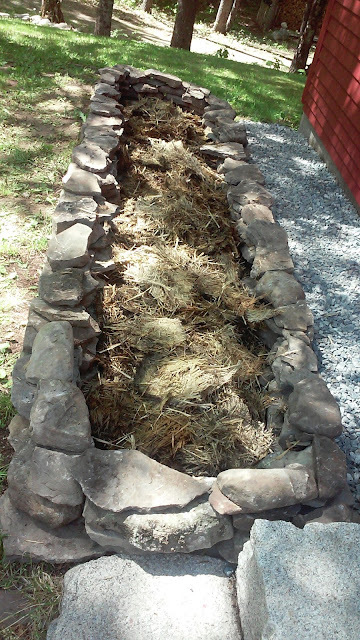 To save some compost and improve drainage I pulled a rotting bale of straw that was abandoned behind the tool shed from the previous owner. 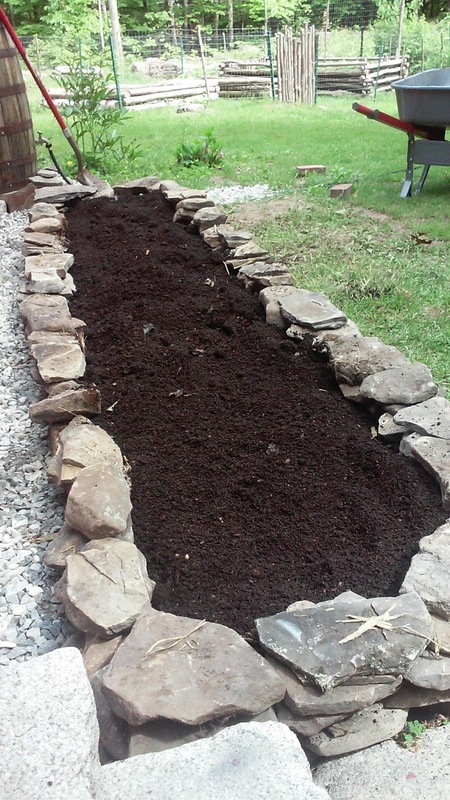 After an afternoon of hauling rocks and compost the progress finally started becoming apparent. Im pretty happy with the final product, though it is temporary enough that if I find Id like to alter the design it will be an adaptable base to do so with. For this year we decided just to pick up some interesting annuals out from the local greenhouse. I also planted a row of sunflowers along the back edge of the beds but after a few sprouted the abundant chipmunk population took notice and mowed down the lot of them overnight... luckily I have a dozen or so I started in pots that I will transplant when they get large enough to ward off the little rodents. Along with some annuals we also snuck in a couple lavender plants and a toothache plant I picked up from the Kennebec Flower Farm at the Portland Farmers Market ! The plan is after smothering everything with the weedblock below the soil this year, we will plant some small shrubs and perennials in the spring next year when I can dig down and cut through the weedblocker where I want some shrubs to root deeply into the soil. Stay tuned for that project next spring. Along with the front flower beds we also planted some flowers among the vast array of perennials that we are so grateful appear with great abundance in the most unlikely spots. I think last years brutal winter held back some of these surprises during our first summer here, but this year things are looking quite vibrant and colorful ! A little raised bed I constructed last fall when I was moving the last of our compost into the makeshift bin greets us in the driveway everyday we come and go. We also put together a few hanging baskets with some cheap pots we found at Marden's. Another landscape project we tackled this spring was rehanging the birdfeeders with a proper cable as the previous one was choking a tree that had since died and needs to be dropped before it becomes and issue. This proved to be the most time consuming project... its funny how sometimes the "simple" little projects turn into headaches with multiple trips to the hardware store and lots of trial and error with ferrul sizes and swag tools coming into play. Either way the birds seem to be enjoying their new feeders, as are those pesky little chipmunks who seem to always be gorging on the seeds that make their way to the ground below. With those projects completed and the perennials popping up in every directions, I figure I will just leave you with a collection of some of our favorite blossoms, some of which I have yet to identify.